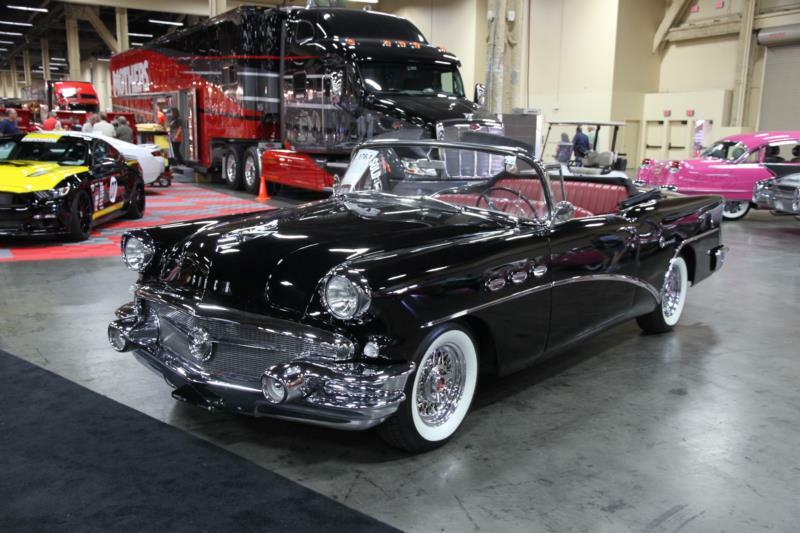 Buick’s entry-level Special was all-new for 1954, with a wider and lower stance, a less pronounced rear fender hump, blunt tailfins, new steering linkage, and better power steering. The mid-size model was the best-selling Buick, and was offered at a two-door sedan, a two-door Riviera hardtop (itself the best-selling Special for the year), a four-door sedan, a four-door station wagon, and a six-passenger convertible. Hardtops and convertibles had rounded rear wheel arches while the sedan and wagon had them squared off. All body styles had trim over the top of the arch, as well as three ventiports and a striking waterfall grille. Special prices ranged from $2,200 to $3,163. Under the hood, the Special was powered by a new 264-cid V-8 engine that generated 146 hp when paired to a three-speed manual transmission, and 150 hp when mated to the Dynaflow automatic shifter. The 1955 model year was notable for a power boost courtesy of a four-barrel carburetor that now rated the Special’s V-8 at 188 hp. A new variable-pitch Dynaflow automatic transmission livened up the car’s acceleration. Also, along with Oldsmobile, the industry’s first four-door hardtop sedan appeared. All Specials received a bolder grille, more pronounced “Dagmar” bumpers, and well-defined rear fins. Inside, upholstery was upgraded and sliding sun shades were added. Color choices were greatly expanded as well. Buick Special production accounted for more than half of the brand’s total sales. This generation of Special’s final year saw minimal exterior changes. The grille curved forward more, the Dagmar bumpers were flattened, and all body styles had a curved rear wheel arch. More importantly, the same 322-cid engine became standard across all models, with the Special’s V-8equipped with a two-barrel carburetor in for 220 hp. The Dynaflow transmission was improved further, with two stator wheels and faster 0-60 times. All three years of these Buick Specials are solid collector cars, with a good turn of speed, handsome colors, and available trim packages. From a collector standpoint, 1955 is the most user friendly year as so many were sold. Parts, and trim in particular, will be much easier to find. As with any older car, buy the best car available, as it invariably costs more to fix a rough one.